Most people that know me, understand my appreciation for wine. This also includes pairing it with the perfect dish and environment based on my mood. What is your favorite wine experience for a day like today? I think going through the process of creating my own wine gave me such an elevated perspective into the methodical and meticulous steps involved in creating an experience for a consumer. Enjoying wine should be an experience and to create this, you take risks and make choices with that goal in mind. It doesn’t happen overnight and it isn’t easy, but to create this kind of excellence is worth it. When I released King of Clubs, the only retailer where I wanted the brand was Wally’s Beverly Hills. I loved the concept of a fine wine & spirits retail store & cheese shop within a casual, stylish restaurant in the heart of the city. The ambiance brought back memories of my travels and I loved the idea of being surrounded by conversations about wine. Of course, like most restaurants I frequent, I have become friends with the sommelier and wine director because of some of those conversations. 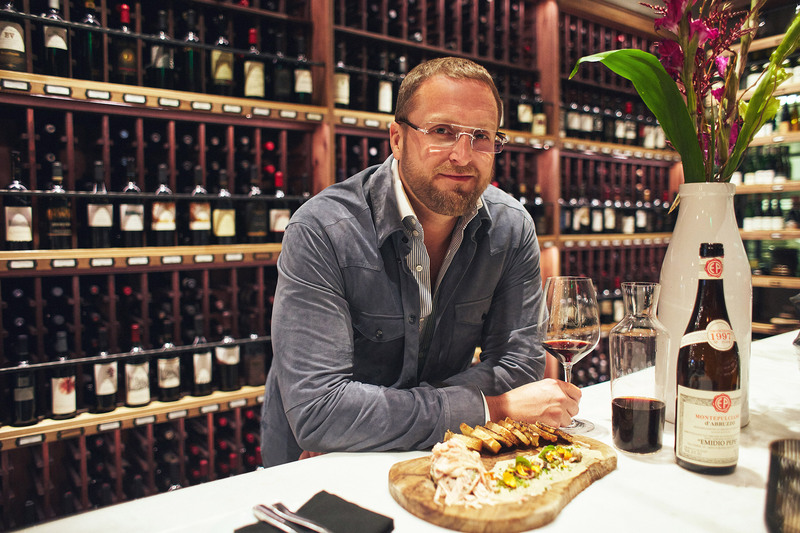 Mathew Turner, the wine director at Wally’s has great insight into the history of different wines and we have often spoke about the best food to pair with our favorite wines. The chef, David Féau’s love for creating the perfect cuisine to complement wine come from his early days of growing up in France. He learned his first lessons in cooking from his mother and his insight into wine and food is remarkable. This evening I was in the mood for an Abruzzo, to pair with my Wagyu Steak Tartare. The Wagyu is as an appetizer that can be shared with the whole table or could work as an entree. 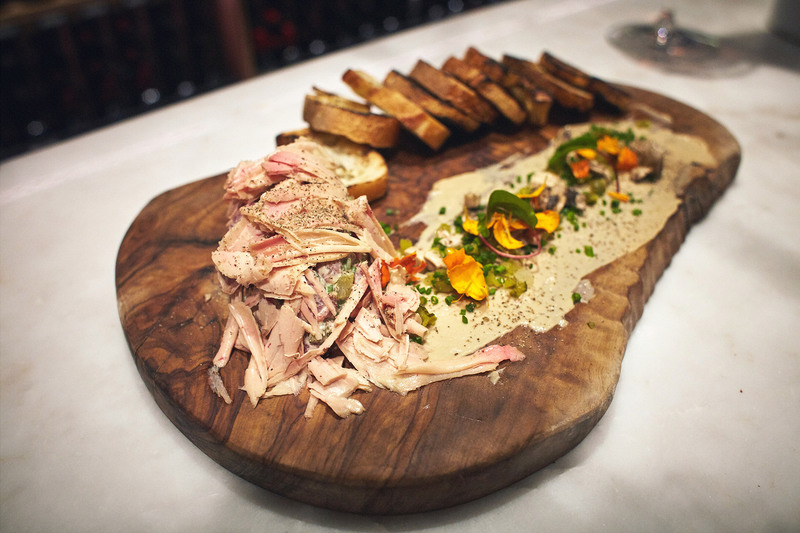 It is served with truffle-tarragon mayonnaise, garnished with white mushrooms and blossoms and topped to perfection with shaved foie gras, all served on a toasted baguette. 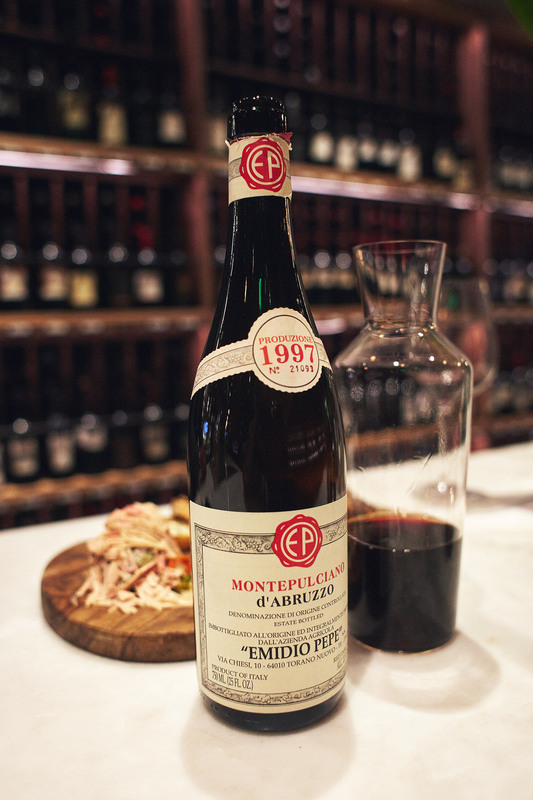 I chose the 1997 Emidio Pepe Montepulciano d’Abruzzo from Italy to balance my meal with the flavors of black olives and traces of mushrooms. This particular wine is part of the movement of artisanal wineries that were bringing both modern and traditional techniques to the art of winemaking. I love that the organic grapes are still crushed by foot, yet they have tried new innovations to create their own version of a well rounded red wine. Just like in creating a fine wine, you create your own experiences. You just have to decide what that experience will be for you.